That�s a text to choose the right answer about Annie�s daily routine! I hope you like it! The students read the text and write the verbs in the correct form, then they answear some questions about it. What time do you get up? What do you have for breakfast? 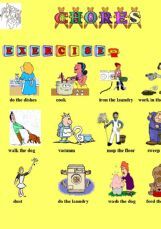 Exercise to practise vocabulary related to housework. There is also some practise on frequency adverbs and expressions and word order in the sentence. Enjoy it!! 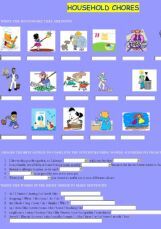 You can teach daily routines and subject - verb agreement with a simple quiz. 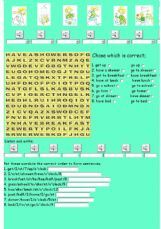 This exercise deals with basic routine vocabulary and it focuses on the use of In and At for parts of the day and time.